There's a whole bunch of references here to races and whatnot. I'm sure not all of it will make sense (I mean it does to me, but I wrote the thing) but check out the previous entries on the people of Husk over here (Part I) and here (Part II). Part I is here, Part II is here, Part III is here, Part IV here, Part V is here and Part VI is here. The end result was the breakdown of social systems provided by the Viperium. The Orb was plunged into an new era of isolation and separation, but from this shattered empire arose may new and varied societies. Some good, some bad, but all free to choose the world in which they lived. For the first time in their history, as told to them by their former slave masters, The Children of the Narghwa were free. Once this realisation had sunken in, the Children began to express this freedom. The greatest effect of the departure of the Narghwan overlords was the almost desperate attempt for each of the Child Races to establish their own unique culture and identity. Free of the homogeneous doctrines of the Viperium each people sought to distance themselves from each other, to mark themselves as an individual race in their own right. Millennia of repression were cast aside, and new prophets and visionaries sprouted every day, proclaiming their ideas that strove to lift their race out of the quagmire of Viperian blandness. New religions and beliefs spread like wildfire – if the Viperium was not the divine empire, then any race was eligible to be descended from Gods. Heretics and blasphemers suddenly held sway. A plethora of new faiths sprang up and died, then rose again in some new form. Eventually a core number of faiths and beliefs took hold and grew into the numerous practices seen across the Orb today. Some have fallen by the wayside; other, newer religions have taken their place. Whether there is a correct religion, or a universal truth, none knows, save that the majority of faiths recognises the right of an individual to choose their own path to god. Tolerance of differing views, and celebrating such differences is to be expected. The Mocker was widely admired and venerated, being incorporated into many religions. Most organised faiths began searching for pre-Viperium relics that might give credence to their beliefs. Sadly, few artefacts have ever been found. The Shattering became a time of great upheaval, with millions of different peoples migrating to lands where their physical forms were more acclimatised. In the starkness of sudden free will people sought the comfort and safety of familiarity, and members of the different races began to unite with others of their kind, to share their experience of what it meant to be who they were. It was during this time that many of the unique cultural mores of each sentient race were defined, and many still hold a powerful sway even today. It is perhaps even more remarkable that the different races were able to unite given the scale, the immense size of the former Viperium, and the complete breakdown of social systems such as communication and transport. The Narghwans lust for control meant that they had shared little of their knowledge with their underlings. The technology had remained in the hands of the Viperium since their schism with the Bhulkulbs, and with its collapse came the loss of much of the scientific knowledge stored in the Narghwan minds. The great devices they used in running the Viperium soon ground to a halt, and from there the rest of Narghwan society quickly unravelled. The monoliths and factories of the Viperium fell silent, and were destined to become ruinous testaments to their bygone power. The secret of Mogramid operation died with the passing of the Viperium, and they have remained unused to this day. Only the oldest forms of transport where available to the freed peoples of the Orb. Some took to the domesticated beasts that ploughed the lands to feed the former slaves; some retained or rediscovered the art of ship building, and a handful of the flying vessels that once filled the air remained in operation, but even they succumbed to wear and tear, and with only a small number of replaceable parts the flying machines were eventually grounded forever. The various colonies on the planets and moons were effectively cut off to all save the strongest and most enduring flying creatures, and contact with these isolated peoples was very difficult to maintain. Only the most dutiful of the freed slaves remained to operate the Lighthouses that communicated across the Orb, and for centuries this was the only method of communication maintained between the Orb and the Little Worlds, til at last one by one even the Lighthouses fell into ruin. Despite the speed of social breakdown across the remenants of the Viperium several cultural forces managed for a time to maintain control over regional areas across the Orb. The majority were fortunate warlords who still held within their ever-dwindling arsenal a collection of powerful weapons with which to enforce their command. Yet two particular social movements outlasted these warring factions. The first was the Followers of the Flesh – those who sought to emulate the act of self-sacrifice as laid down by the Carcassanc over 600 years prior. Since then it had flourished into a organisation that wielded considerable influence among the Children of the Narghwa, and whose power structure lay outside the confines of the Viperium and thus survived the downfall relatively intact. The Fleshites maintained their organisation throughout the Shattering, and continues to function even to the present day, albeit in a somewhat different form. The other force to be reckoned with in the earliest days of the Shattering was the cult of personality that formed around the Mocker. He was a living saviour to the Children of the Narghwa, and although he fought hard to maintain his independence and privacy it was impossible for him to shake the burden of gratitude of the people he had freed. He spent several years in seclusion recording his thoughts and teachings, then returned to the battle against tyranny that had risen in the form of the Bhulkulbs. It was a long and tiring campaign that spanned three continents and two decades. With the final defeat of the Bhulkulbs the Mocker retired from public life to a secluded monastery in Gweir Kraom, where he spent the last of his days among the Gurruun. In his notes he remarked on the irony that in freeing the world from tyranny he had imprisoned himself with fame. And that, folks, is the end of the History of the Hollow World. At least as far as I wrote it ten years ago. What follows are some notes about what areas would remain civilized in the Post-Viperium world and the dark age that enveloped it, as well as a few notes on some of the key events leading up to the present day in the setting. Numerous small kingdoms and citystates are formed, and centuries of skirmishes and little wars ensue as battle one another for resources, technology, and ideology amid the ruins of the Viperium. Where civilisation survived but the borders were closed. Where all vestiges of civilization where lost. After a time, countries begin to form as particular kingdoms rise in power over their neighbours, til after a few centuries most regions are dominated by particularly powerful countries with surrounding tributaries. All manner of social systems arise as they are separated by vast distances and physical barriers – with the age of migration coming to an end, there is less transfer of new ideas. This time would be comparable to the era of 250 BCE. All done. Thanks for sticking with it. Part I is here, Part II is here, Part III is here, Part IV here, and Part V is here. How Queen Gharda convinced a crew of Guruun stoneshapers to work for her has always remained a mystery, but it is clear that they were more than willing to create a new Mogramid on Mephiyeh despite the old memories of betrayal. It had been nearly two thousand years since the last Mogramid was constructed, but the plans and knowledge to do so had not been lost. The dreaded Warck capabilities of the ancient Mogramids was disabled to allay the fears of the other Queens, and with its completion Gharda relocated her courts to her new domain. Her namesake lands she kept for herself, but as a token of apology for the inadvertent ruination of Karjnivarj she handed over control of Djunat and Benopoca to Queen Harioc. It appeared that Gharda was intent on claiming all of the planets for herself, and the pride and envy of the other Queens could not allow this to happen. 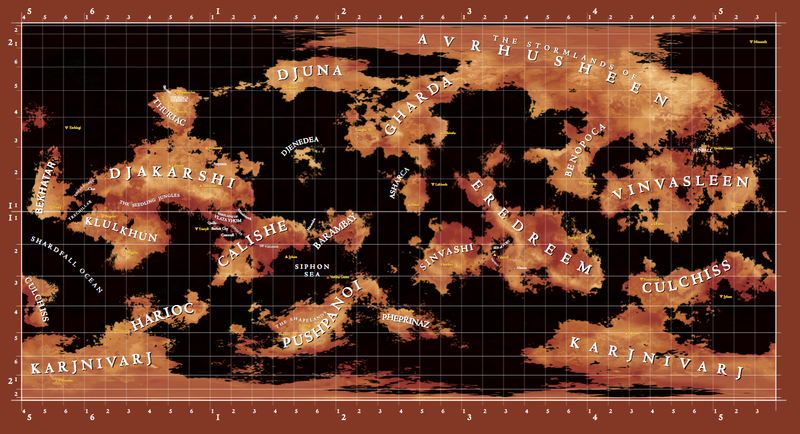 Yet Gharda was content with controlling only Mephiyeh and its moons ­­­– instead she assisted the others in laying claim to the inner planets by granting use of the new Mephiyeh Mogramid to transport armadas of colonists. 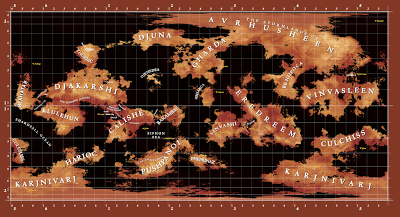 Gharda’s Guruun also assisted by building Mogramids and Lighthouses on each planet and their moons. Only the innermost planet of Pheocudi lay beyond the reach of the Narghwans, for it orbited too close too the Heartsun and was bathed each day in its fiery brilliance. In every inhabitable corner of the Orb the Narghwans now ruled. With total dominance of the Orb it was only natural for the Queens of the Viperium to turn their lust for complete control to what lies Beyon. Viperium records indicate a number of Narghwan philosophers concentrated much of their time on the Beyon, the mythical realm that lay outside the surface of the Orb. Many theories were postulated and eventually, as each Narghwan Queen sought to gain more power over each other, they individually began sponsoring a number of expeditions down into the Suntunnels. At first these were secret missions, none of which claimed any success. Then the Narghwan Queen Gharda publicly announced her grand vision: to harness one of the planets and hurl it down into a Suntunnel. All her resources were focused on flying Guruun stoneshapers, millions of Viethie slaves, and the greatest Imajioneers at her disposal to the small planet of Cusht. Eventually they were able to carve out of the planet itself a number of great engines that tapped the latent power within the planet. However great disaster struck during the construction, and the planet ripped itself apart, destroying the millions who were on the planet at the time. It was suspected but never confirmed that the Fael were responsible – it is not hard to imagine that another Queen may have had some influence in the tragedy. Gharda was not to be put off by this sudden setback, particularly as Queen Harioc had begun a similar operation on one of the moons of Volperqu. Perhaps it was this imitation, or the speculation of sabotage, that galvanised the Ghardan project. The second attempt was a race from start to finish, using lessons learnt from the first disaster, and much to the surprise of her other Sister Queens the planet Mephiyeh suddenly shifted out of orbit one day. On board were Queen Gharda, her greatest captains and scientists, a million Viethie warriors and the best navigators and astronomers. The problems faced by the Beyon Expedition were immense. The planetship had to avoid a collision with the numerous other bodies that share the skies; it had to be aimed perfectly to enter a Suntunnel at the right angle or it would smash into the side upon entry; and it had to find its way through the Suntunnel to its unknown destination before the Sun entered the Tunnel and caught up with it. It is amazing to think that it even managed to enter the Suntunnel, but it was at least successful in this endeavour, entering the Suntunnel hot on the tail of Verliha, the thirteenth sun. The rest of the Viperium watched and waited with wonder and fear. Two days later Verliha emerged, but its coming was heralded with great destruction and flame. The Sun burst forth in a swathe of apocalyptic fire that scorched the surrounding seas, and Viperium astronomers quickly realised that the Sun was off course and unlikely to pass back into its Suntunnel when it set. Sadly little preparation could be made and by Dimdusk Verliha, the thirteenth sun, collided with the continent Vinvasleen, effectively destroying it and life on the continent. The Narghwan Queen Vinvasleen escaped with her retinue via the Mogramid to Serpentia, but she never returned to her old realm. Verliha was shattered open in the cataclysm spilling forth its energies over the land. The planet Mephiyeh, Queen Gharda and over one million servants were never seen again. The collision of the thirteenth sun into Vinvasleen sent a literal shockwave across the Orb. Vinvasleen was shattered into the broken continent we know today. Giant waves swept across the surrounding lands, drowning millions in Behkatar, Culchiss and Avrusheen; the ground was permanently maimed, its fiery blood seeped out across the remains of the devastated land from gaping cracks that ripped across the surface of the Orb. Huge storms swiftly followed, engulfing Vinvalseen for more than a century – even today remnants of the disaster can still be seen, in the Ruined Lands and the Huajyji Hunterstorms. With the amount of destruction caused by the collision it is surprising that the Viperium survived the Orbshock Cataclysm. However it is not the Orbshock that finally cast down the Viperium, but the work of one single creature. No one knows where the Mocker came from, although legend tells that he came from the lands of Vinvasleen. His origins remain unclear, but there are no records of his name prior to the Orbshock catastrophe. The Mocker first came to attention of the Viperium several years after the Orbshock, when the Viperium was busy repairing its devastated empire and mourning the loss of Queen Gharda. The sheer vastness of the Viperium’s wealth and resources enabled it to weather the Orbshock’s devastation, and after several years of chaos it appeared that Narghwan control was being restored. Then in the lands of Bekhatar the Viperium suffered its first open rebellions. Through some Imajion power an agitator was freeing the Children of the Narghwa from their millennia of slavedom. The Hapi Hara Rebellion spread from Bekhatar to neighbouring Chanka Chee, and the mysterious Mocker was always at the head of the uprisings. It seemed he was immune to the controlling powers of the Narghwans, and they could not send their vassals to attack him, for he would simply free them as they approached - the phrase ‘Hapi Hara Haru Harumpa’ held a great power over those controlled by the Narghwans, freeing their minds from their masters’ control. Eventually the Narghwans were forced to call on their enemies the Bhulkulbs to deal with the matter, and their brutal repression of the Rebellions has not been forgotten - but by this time the Mocker was on the other side of the Orb, causing havoc throughout the Viperium. His main weapons appeared to be wit, humour, and his grasp of Imajion. There are many tales of his exploits during this time and these shall not be detailed here, suffice to say that eventually the Mocker found his way to the heart of the Viperium - The Court of the Narghwan Queens. The greatest mystery ever known will always be the conversation that took place between the Mocker and the Narghwan Queens. All that can be deduced from records of that time is that The Mocker was invited to the Courts in Serpentia, where he held private audience with the five remaining Queens for a day and a night. The following dawn a great shockwave of emotion suddenly rippled out from the Court itself, piercing the heart and mind of every Narghwan, every subject and every slave. The wave rolled out across the city of Serpentia, and continued out across the continent of Djakarshi and up into the aether to the planets, til every single sentient creature in the Orb realised that a great doom had befallen – The Narghwan Queens had vanished. The piercing presence in the mind of every one of the Narghwans had been taken from them, and a great keening went up from the fanged mouth of every Narghwan, but the Wailing Day was drowned out by the Nights of Joy, when every subject and slave of the Viperium realised that for the first time in over three thousand years that freedom was theirs. Their immediate response was to proclaim The Mocker their new ruler, but he turned on those who would make him King, cursing them for learning nothing from his efforts. He had fought to give them freedom, not to rule them. Yet even the Sevenbred knelt before The Mocker at the gates of Serpentia, before returning to their slumber without a single act of violence. Eventually the people demanded that he lead them through this time of uncertainty, but he withdrew to the vast palace of Serpentia and hid for a time. With the power of the Viperium so firmly invested in Narghwan Queens, their unexpected departure left the vast Viperium without any leadership. So greedy were they with their power, and so long had they been in control, that there were none with the ability to replace them. The Viperium command structure quickly fell apart without the guidance of their Queens, and with the spreading Hapi Hara Rebellion the Viperium soon collapsed. The world-spanning control held by the Viperium was shattered into thousands of tiny regions. The Narghwans were so overcome by their loss that they could do nothing but grieve, and it fell upon the freed Children of the Narghwa to take control. Yet they had never been in control of their own destinies, and many failed at the first opportunity, preferring to return responsibility for their lives to those willing to lead them. In some areas this command was thrust upon the unwilling but very able; in others despots rose to power. The Bhulkulbs attempted to seize power in some regions, and for a time were successful, but the Mocker appeared in these lands to fight against such tyranny. Yet for all The Mocker’s efforts there was naught he could do to stem the growing anger and violence that was hurled upon the now powerless Narghwans. So great was their grieving that they offered no resistance to the rage that fell upon them, and across the Orb their golden blood was spilled. They did nothing to hide or flee, and when their former subjects came to wreak their vengeance upon them the Nargwhans chose death to a life without their Queens. Great mobs of deathsquads ruled the cities of the Viperium, and as the chain of command of the Narghwan caste system was destroyed it severed the mental link that the Narghwans shared with one another. It was realised only too late that this sudden separation from their brethren cut the links of their group mind intellect, and with each death of their kindred the Narghwans descended into a stupor of apathy and loss. The Narghwans had finally been overthrown. Only in the realm of Gharda and did the Nargwhans continue to hold sway; with their Queen already taken from them during the Beyon Expedition they had already adapted to life without a ruler. The Six-by-Six, as the ruling council of Gharda was known, closed the borders to all save the few of their kind who sought refuge. They refused to have any dealings with outsiders and the Ghardan peninsula became a forbidden land. Part I is here, Part II is here, Part III is here, and Part IV here. Slavation for the Naghwarans came in a most unlikely form, and was to alter the course of history. With all their focus on the terrors of the Sevenbred and the widespread starvation that was crippling the Viperium, little heed was paid to early reports that a great creature that was sighted in the waters of Trechilarr Bay. Soon it became clear that an unknown beast had risen from the depths and had taken to land. And what a beast it was ­– at over fifty miles in length and five in diameter, the great blood-coloured slug was the largest creature by far to roam the Orb. Its burgundy skin was slick and covered with thousands of vibrant yellow pores lining its slime red skin, and with each opening and closing of these orifices, giant red-leafed trees tumbled down its side to take root in the upturned soil of its passage. Its head consisted of a vast maw that was edged in long protrubences that probed the ground in front of it for the dead matter it voraciously consumed. It was named the Slitherseed Wyrm, as it devoured waste and gave off new life in return, leaving new forests in its wake. The Slitherseed Wyrm inched forward at a terribly slow pace, covering no more than a few miles a day. The Viperium dispatched numerous patrols and scientists to study the Slitherseed Wyrm, which after exhaustive research concluded that the only threat it presented was the destruction of anything that lay in its path. Given that it was creating new swathes of forest at a time when the Viperium so desperately needed to reinvigorate their natural environment, the destruction of several towns and cities was considered an unfortunate side-effect of an otherwise most welcome blessing. The Narghwan Queens were also concerned about what would happen if the tried to harm it in any manner, and prudently decided that it was best left alone. When the Slitherseed Wyrm finally left the coast and headed inland towards Djakarshi, Viperium harvesters were sent in to the newborn forests to see exactly what resources were offered by the strange red flora. They found that the forests were already occupied and guarded by a previously unknown species of small sentients. Little creatures made of root and soil, they spoke the Forked Tongue of the Viperium and called themselves Jyxi. Guardians of the trees, they claimed they had been sent to protect their brothers from the depredations of the Viperium. The Narghwans would not brook any resistance to their plans to harvest the forests, and soon violence broke out between the Viperium and the Jyxi. They were immune to the mind-controlling powers of the Narghwans, but they were few in number and relatively weak in comparison, and were driven away by the Breedtroops of the Viperium. The Slitherseed Wyrm continued its meandering trail across the continent, unmoved by the plight of the Jyxi. Fortunately for the Jyxi they had unknown allies. It is at this time during the occupation of the Seedling Jungles that the tall Fael first appeared, mysterious humanoids wrapped head to toe in thick red shawls. Though very few in number, they defeated the Viperium’s soldiers with incredibly powerful displays of Imajion, the kind of which had not been seen since the First Battle of Vlata Yhom. The Jyxis were able to return to the forests, and have never left, for the Viperium was unable to press the attack as it was still exhausted by the Underwar with the Bhulkulbs. The Fael vanished at this time, but ever again they would reappear to harass the Viperium wherever it was weak. While the Fael may have saved the Seedling Jungles for the Jyxis, it came at great cost to the slaves of the Viperium, for they hindered the restoration of the Viperium’s agriculture, worsening the starvation that plagued the Orb. However Viperium agents were able to remove a number of seedlings from the new forests before the Fael defeated them, and the seedlings were shipped across the Orb to each of the Narghwan Queens, who then proceeded to alter them using the lifeshaping technologies that the Bhulkulbs had used on the Hues. Combining this with the replicating technologies used to create the Breed, the Viperium was soon able to begin replanting the growing deserts that that crept into once fertile lands. Although it was several decades before the Viperium’s food shortages were overcome, hope was now at hand. With the essentials needs of the Viperium restored, the Narghwans were enamoured with a new era of creation and invention. The long process of rebuilding their decimated empire commenced. It was clear that the Narghwan Queens had a change in their philosophy – their rivalries and jealousies remained, but they began expressing their competition through creative processes instead of destructive ones. While the bitterness of the Thousand Year War always remained, the Queens sought to outdo one another through acts of culture and civilization. With so much destruction to be over come, the Renaissance first took hold in the field of architecture. At first small but beautiful buildings were raised to commemorate heroic deeds during the Thousand Year War, as well as temples honouring the Flesh of the Carcassanc who had since become a widely worshipped member of the Narghwan pantheon. The small works slowly gave way to grandiose monoliths and structures as the Viperium economy recovered and the Children of the Narghwa grew in number once again. Sculpture quickly followed suit, decorating the new architecture with scenes of violence and glory. The heat sculpture technique was developed at this time to appeal to the Narghwan ability to see into the realm of warmth and cold. While quickly emulated across the Orb, the art was never as beautifully rendered as in the capital of Sinvashi where the first heat sculptures still stand today. Other artforms benefited greatly from this new era of cultural growth, with the Narghwan Queens eagerly seeking out new talent to patronize. Painting and music both underwent massive changes, and all manner of strange creatures were constructed in the name of art using the Breed technologies. Some were truly horrifying perversions but other did attain widespread recognition as the most beautiful beings in existence. It is said that the Fing artist Biansara was the leading visionary of the biotapestry field, and her art is rumoured to have moved her patron Queen Vinvasleen to tears before her untimely disappearance. A clandestine network of artist kidnapping grew in the shadows of the cultural regeneration, as the competition between the Queens grew fierce. Yet violence between the Queens was a thing of the past in this new era, and even the threat of it was considered a breach of new moral standards. The Mogramid question still remained – Queen Calishe had seized the Barambay Mogramid by force before the war with the Bhulkulbs, and the few Mogramids that remained operational after the Bhulkulbs’ sabotage had been claimed by the others. Each of the Queens had access to at least one Mogramid, but for now it was believed that to use one as a Wrack weapon was something that no Narghwan would stoop to. It was a golden age for the Viperium. With the Sevenbred returned to their slumber, the Bhulkulbs defeated, starvation overcome, and peace between the Narghwan Queens, the Viperium appeared more united than it had been since its founding. With only the inconveniences of the Slitherseed Wyrm to deal with and the occasional acts of treason by the troublesome Fael, the Narghwan Queens turned their minds to the deeper questions of their existence. That they were gods was clear, for the claimed mastery over the Orb and there were none that could defeat them – even the Guruun, who had remained in isolation throughout the Thousand Year War, had opened up new dialogue with the Viperium, and now sought trade in return for the Guruun’s healing of the lands that had been ruined by war. Nargwhan society functioned smoothly and required little guidance from its Queens. They had what they wanted – complete dominance ­– but it slowly became clear that it was not enough. It is at this time that perhaps the greatest evolution in Narghwan society could have been achieved. Though the Children of the Narghwa had no voice of their own, it became fashionable in certain Narghwan circles to speak of freedom for their slaves. It was easy to command respect and obedience by force, but what of worship given freely? It is said that Queen Harioc began experimenting with such notions, and her courts were renown as a place of advanced thought and free speech. It is possible that at this time Narghwan society could have evolved into something greater than the legacy of violence and repression by which it is now known. Had Queen Harioc but a few more years with which to toy with such ideals, it is possible that they could have spread to other places and been the next step in the new morality which was blossoming in the Viperium. Sadly, the greed of the Narghwan Queens was to take hold once again, and Queen Harioc turned aside from her experiments in order to stay in competition with her rivals. For while she had explored philosophy and her sisters were enamoured with the arts, Queen Gharda was ever mindful of her former conquests, and was determined to take back what was once hers. The Palace of Storms was first seen off the coasts of Asharca – a towering bastion of huge golden blades and spines that hovered in the skies of the Orb. There had been rumours of a mysterious flying juggernaut for several years, but when Queen Gharda unveiled her newest creation, the other queens feared the worst – that she had returned to the ways of old and had constructed a new weapon. Ambassadors were sent from across the Orb to maintain peace, but when Queen Gharda granted them audience she assured them all that war with her sisters was furthest from her mind. Instead she invited her fellow Queens to send what flying vessels they were willing to spare to aid her in reclaiming the planets from obscurity. A claim of the planets equal to the portion of the aid given was what she offered in return. Not all of the other Queens trusted her, but none would be excluded from the chance to recolonize what was once theirs. Both Sinvashi and Harioc made sizable contributions to the vanguard fleet that was to take to the skies, but rumours of a return to the age of conflict began to spread, and warmongers began to hold sway in the courts. Quietly the war machines of old were prepared, readied for any possibility, but this only served to increase tensions between the Queens, and was unnecessary as Gharda kept to her word. Once all preparations for the expeditions were complete, Queen Gharda unveiled the full might of the Palace of Storms as the planet Mephiyeh hung low overhead. In the sky above Avrusheen the Palace came to life, its many rings of blades began to spin, and strange cloud formations began to appear in the surrounding aether. The faster the blades spun the denser the gloom, and soon long swathes of mist were being drawn in towards the palace. A great thunderstorm began to brew beneath the Palace of Storms, and above it a huge funnel began to form. The surrounding lands were battered by the worst weather even seen, but in the hollow core at the centre of the Palace the vanguard fleet waited in peaceful calm, sheltered from the Storm. The funnel grew to immense proportions reaching ever higher into the sky, a vast grey tendril of twisting cloud wreathed in lightning – and as Gharda had planned, the Duskeyr came. A storm of this magnitude was too tempting for the lightning eaters, and they were irresistibly drawn to the bolts of energy that danced between the Palace of Storms and the maelstrom it created. Gharda called this inverted hurricane the Writhe, and like a hurricane the heart of the Writhe was calm and safe, from the palace through to the tip of its funnel. The top of the funnel whipped across the sky, seeking out the planet Mephiyeh which it eventually found. With the connection made between the surface and the planet, Gharda commanded the vanguard to fly up through the funnel at the heart of the Writhe, protected from the Duskeyr by its raging winds and lightning storms. Unassailed the vanguard reached Mephiyeh in a matter of hours and immediately set about reclaiming the planet for Gharda. The Duskyr were trapped in their gluttony of feasting and were unable to take any preventative action. They had lost control of the skies, but not all things went in Gharda’s favour. With the successful invasion of Mephiyeh the captains of the Palace of Storms were commanded to power down and dispel the Writhe. To the captains’ dismay the Writhe would not dissipate, and the vast storms continued to rage for days after. The continent of Avursheen was plunged into a never-ending assault of blizzards and tornadoes. Avrusheen was slowly covered in a blanket of snow. Worse, the altered weather patterns were mirrored on the far side of the Orb and similar but less violent effects were becoming common in Karjnivarj. Fortunately the Writhe remained fixed in central Avursheen, but Queen Gharda was forced to relinquish control of the Palace of Storms for safe keeping in Serpentia. Within two years both Avrusheen and Karjnivarj were covered in thick sheets of ice, and Gharda was forced to pay Harioc vast sums to compensate for the ruination of her land – but Gharda cared little for such burdens, for the expeditions on Mephiyeh were going better than she had hoped, and the Guruun she had secretly transported there begun work on their new creation. PORPHYRY: World of the Burn is DONE! PORPHYRY: Face Off from start to finish.